I remember attending my first mixing masterclass back in 2010, in which a collection of industry professionals presented before’s and after’s of their work. That was the first time I became aware of the staggering impact a good mix can have on how a piece of recorded music is perceived. 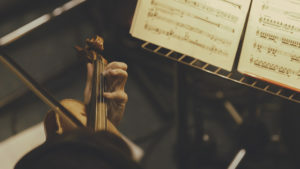 While we’re all familiar with well-made records, hearing a piece of music before and after its mix illuminates the importance of this stage in a record’s creation; it is the stage of recording most overlooked by the classical community, yet one which provides a wealth of creative opportunity. 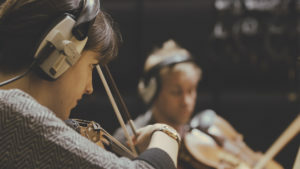 In the classical recording world, many of the recording techniques used on traditional recordings are there to present the most honest and clear representation of a performance as is possible and, within that remit, there is little room for creative manipulation of recorded material. Approaching Islandia from the perspective discussed earlier in this series (which is to say the recording being a creative work unto itself), I wanted to find a line between a natural performance and the intimacy of a studio-produced record. For example, my first instinct was to use a reverb to ‘place’ the ensemble inside a small concert hall (i.e. using a convolution reverb, modelled on the sound of an existing concert hall, to change the perceived environment in which the recording was made). I created an initial mix of the entire album using this method and the result hinted at a traditional record, in which the performers were heard within the performance space, but I found this to be a meaningless achievement — the album wasn’t recorded in a traditional space, or in a traditional way, so why try to change that? This took me on a fortnight of experimentation with various delays and FX chains — processes not often affiliated with the creation of a classical record. Never would I have thought that an intimate recording and natural performance would be heightened by the use of two purely synthetic reverbs: an AMS RMX16 and a REV7 from 1985. If you’re not familiar with these units, think of any record from the 1980’s with a dated-sounding drum kit, particularly the snare drum, and the chances are that the record was made with at least one of these reverbs — not something I’d instantly affiliate with a chamber orchestra…more of a Phill Collins thing. To my surprise, the combination of these two reverbs gave the recording a sense of depth; they took the musical material and made the process of listening to it more engaging; they were felt rather than heard. The point of mentioning this is that I believe the experience of listening to Islandia is heightened and made more colourful by this creative decision and others, such as sending the trumpet to a tape delay, or manipulating piano harmonics to further their sustain. These are all creative ideas that have an impact upon the listening experience and, as such, should be embraced by creators of new music, not shied away from in the name of tradition. With the technology that is widely available to creators of music the world over, the depth to which we can manipulate timbral colour and orchestration is unfathomable and is a bold, new area of exploration for composers of contemporary classical music. In the coming months, Islandia will see its release; the culmination of an inspiring two years, which have taken me from the isolated coast of Aldeburgh in Autumn 2015, through to the summer festivities of Hull City of Culture 2017 and Abbey Road Studios. My website will keep you updated regarding the album’s release, as will my Twitter feed. As for me, I’m moving on to my first commission for 2018, which is part of a year-long residency with Manchester Collective; I’ll be documenting my work on 100 Demons through this blog, so I hope you’ll follow my progress on what is set to be an exciting collaboration with this fantastic new chamber group.